The unfortunate truth about running a successful store is that stores are completely reliant on slim profit margins. The idea of creating an extra expense via replacement shopping cart wheels may seem more burdensome than shrewd, but it’s a move that can pay dividends in the long run. From small-time bodegas to corporate retail giants, every store that employs shopping carts will at some point see them wear down and begin to fall apart. The wheels are no exception. Frequent usage every day will see wheels break down, falter off their axles, or get clogged with debris. You want your business to positively stand out in your customers’ minds, and noisy, inadequate shopping carts detract from this ideal. Jammed carts become difficult to handle, and injuries arising from broken carts can result in hefty legal penalties. To add insult to injury, faulty wheels can leave streaks on concrete or tear up carpet, leaving your floors with an unprofessional look. Reassigning an employee to clean these messes up means your business loses valuable productivity. 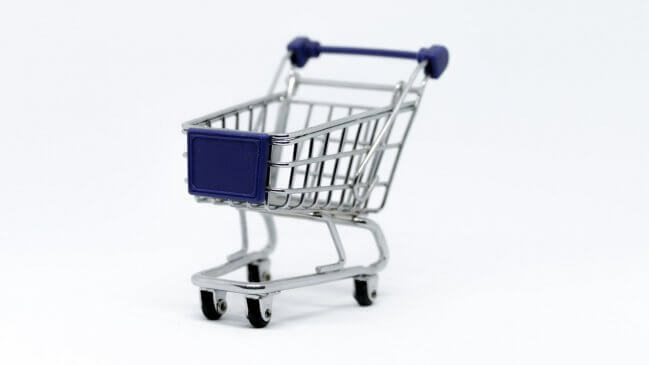 The wheels of a shopping cart are a type of caster, which is a wheeled device that connects to a larger object for the purpose of the relatively easy rolled movement. Casters have the ability to swirl around in all directions, giving you more maneuverability but less control. In most American shopping carts, only the front two wheels are casters; the two wheels in the back are fixed and do not swirl, granting stability to the cart during turning that casters cannot. When selecting replacement wheels, be sure to keep these distinctions in mind. Most casters outfitted for shopping carts are made from a plastic called polyurethane. These types of wheels are popular because of their toughness, weight capacity, and traction. Wheels made of polyurethane are also quieter than most of their counterparts, providing a pleasurable experience to your customers. Over the long term, polyurethane wheels resist corrosion and are largely impervious to water, chemicals and other liquids that would break down lesser wheels. Shopping carts play an integral role in your store’s ecosystem, allowing customers to purchase the things they want with ease. Investing in their preservation permits your business to compete with other stores, but more importantly, it keeps your patrons happy. In the long run, the ability to quickly switch out broken wheels will retain customers and allow your business to thrive.